Protecting digital image files while on the trail is a tricky proposition. When everything needed for a good long walk must fit in a small backpack – clothing, toiletries, first aid kit, electronics and cameras – weight and space become significant factors. Reduce, minimize, lighten; this is my mantra when filling that pack. Not too difficult if I am just out for a walk. But I’m also a ‘serious photographer’ and those two words have the potential to add endless kilograms to my load, with every additional gram potentially increasing my discomfort level. I’ve described my camera kit in a previous post and it has not changed substantially since then. So far, that kit has relied on divine intervention to ensure my pictures arrive home un-lost and un-corrupted (good thing our walks tend to be religious pilgrimages!). There is no backup of the thousands of image files on my collection of SD cards. Just the one set of memory cards. Lose one card and I could lose several days of irreplaceable photos. As any junior IT professional (or ten year-old child) will tell you, backing up your data is essential. On a Mac it is as simple as plugging in a hard drive, cranking up Time Machine and, Bob’s-your-uncle, you have a backup. In the ultra-light world of the long-distance walker, carrying a Mac is not an option. Even a tiny laptop is a burden. Hard drives themselves are heavy and, with their delicate spinning mechanisms, even more vulnerable than they are at home on a desktop. In my search for a lightweight, compact means of backing up my photos on the trail, I first investigated the Kingston MobileLite Wireless G2 and offered a preliminary review on WalkClickMake on September 10, 2015. The unit works with an app on an iPad, iPhone or Android device that wirelessly controls the transfer of files between an SD card and a USB flash drive (or hard drive) attached to the unit. 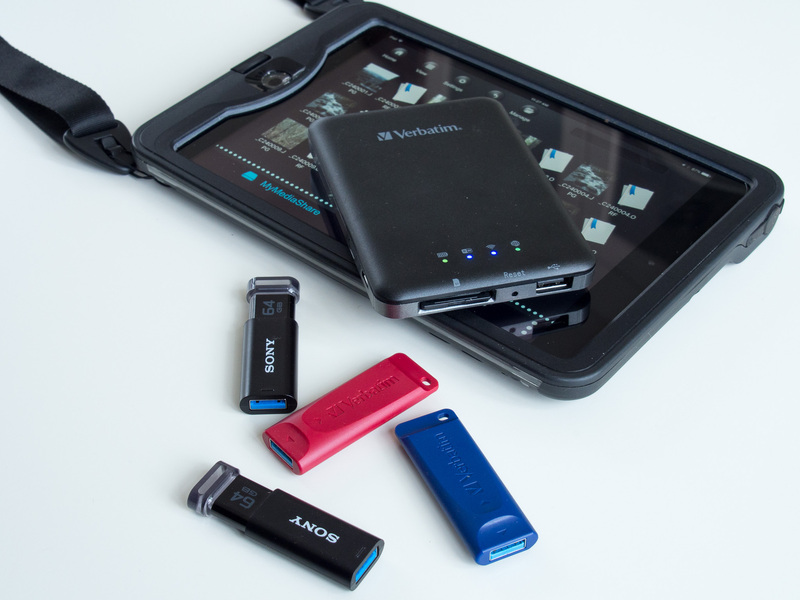 Files can also be transferred wirelessly between a phone or tablet’s Camera Roll and a SD card or USB drive. I took the Kingston MobileLite on our Shikoku pilgrimage but unfortunately, it proved to be unreliable. While copying files from my SD cards to USB flash drives, the transfer would unexplainably stall and quit before transferring all the files. Back home, I ran further tests, copying a full 16GB SD card to a 64GB flash drive. In three attempts the transfer always failed, leaving as many as 300 image files un-copied. The unit had other issues as well. The wifi bridging function (discussed below) was also unreliable. Twice I had to send units back to Kingston for warranty replacement, first because the unit stopped working entirely and then to fix the wifi bridging problem (it didn’t). To its credit, I found Kingston’s technical support to be quick and helpful. It’s too bad the device did not perform as well as its support team. I’ve seen many good reviews for this device but, based on my experience, I can’t recommend the Kingston MobileLite Wireless G2. I was aware of other wireless thingamajigs (these units are hard to describe in a word or two), one being the Verbatim MediaShare Wireless. It was on sale at Staples for a mere CAD $40.00 so I thought I would give it a whirl. 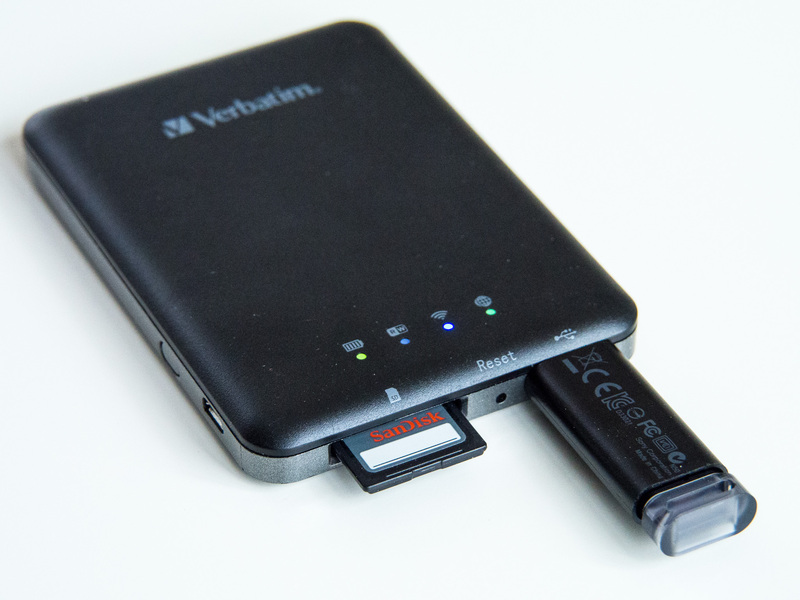 The Verbatim MediaShare Wireless with USB flash drive and partially inserted SD card. Both have batteries that will charge a smartphone. The Kinston battery is larger at 4640 mAh vs. the Verbatim’s 3000 mAh. Neither offers through-charging; you can’t charge the unit and a connected smartphone at the same time. Neither comes with an AC adapter/charger, just a cord that plugs into your own USB charger. Both have a USB 2.0 port for flash drives or hard drives. USB 3.0 drives can be used but at 2.0 speeds. Both have SD/SDHC/SDXC card slots. On the Verbatim, the maximum card size is 64 GB. Both allow wifi bridging. Once set up on the unit’s app, the wireless device will simultaneously connect to another wifi network (at a hotel, for example), so you don’t lose internet access while performing file transfers. Both units are compact and light although the Verbatim is slightly smaller and lighter (121 grams compared to the Kingston’s 168 grams), likely due to the smaller battery. Both units have free Apple iOS and Android file management apps. 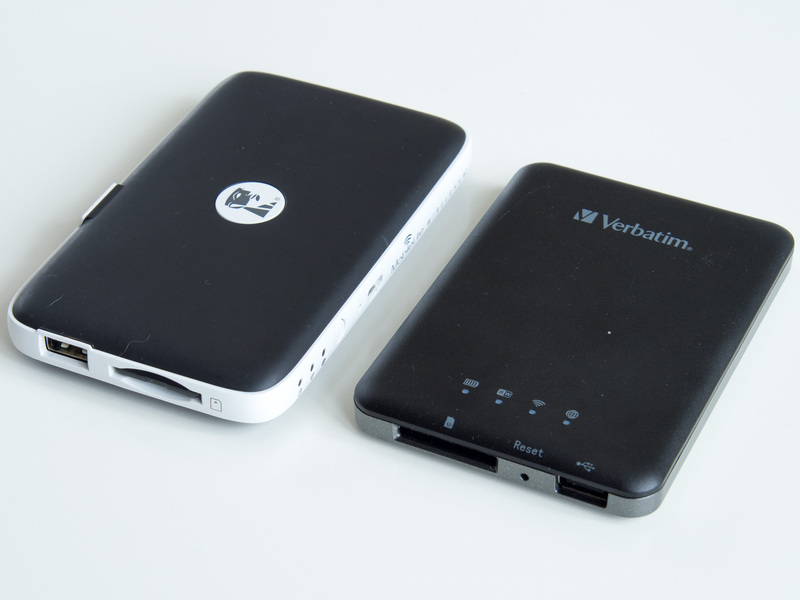 Comparison of the Kingston (left) and Verbatim devices. I conducted the same file-copy test on the Verbatim device that I did with the Kingston, copying the same 16 GB of SD card data to the same 64 GB flash drive (which was reformatted after each test run). The Verbatim MediaShare successfully completed each of its three tests. As stated in my preliminary review of the Kingston MobileLite G2, another significant downside of that unit is that files to be copied must be individually selected – a tedious process if you just want to transfer a day’s shoot of 200 RAW and 200 JPEG files. Suppose you have a modest 16 GB SD card in your camera and add 400 new photos each day. Every evening, you want to back up those photos to a USB flash drive. On the first day you can hit the ‘Select All’ button on the Kingston app to copy all 400 photos on the camera card. By the end of the second day, there’s now 800 photos on the card. Choosing ’Select All’ will cause a dialogue box to appear each time the unit needs to overwrite one of the 400 previously-copied photos, asking you to click an OK button to proceed. It’s a tedious process that needs constant attention during the transfer process. The workaround is to individually select the second day’s photos on your SD card – 400 selections – and upload just those, only slightly less tedious. On the Verbatim unit, ‘Select All’ automatically overwrites any files already copied to the USB drive without any dialogue box asking if it is OK. A little bit scary but it works. And it saves a lot of time and mind-numbing finger pokes at the iPad’s screen. The interface of Verbatim’s MediaShare app is a little bit decorative with its black hammered-steel look and 3-D buttons. Jonathan Ive would not approve! But beneath the surface, the app works well. It is easy to navigate with all the information and functionality needed to perform tasks quickly and efficiently. Download the MediaShare app from the Apple App store to an iPad or iPhone. Turn on the MediaShare device. It takes a couple of minutes for it to establish a wifi network. On the iPad/iPhone, go to Settings>WiFi, select the Verbatim network and enter the password. It’s located on the bottom of the unit…in the tiniest possible font imaginable. Have a magnifying glass handy. Fortunately, this only needs to be done once. Open the MediaShare app. Along the top edge of the Home screen is a row of navigation and menu buttons. Along the bottom edge are two oversized touch panels, MyMediaShare and My Device. Insert an SD card and a USB drive. Make sure MyMediaShare is selected on the app Home screen. 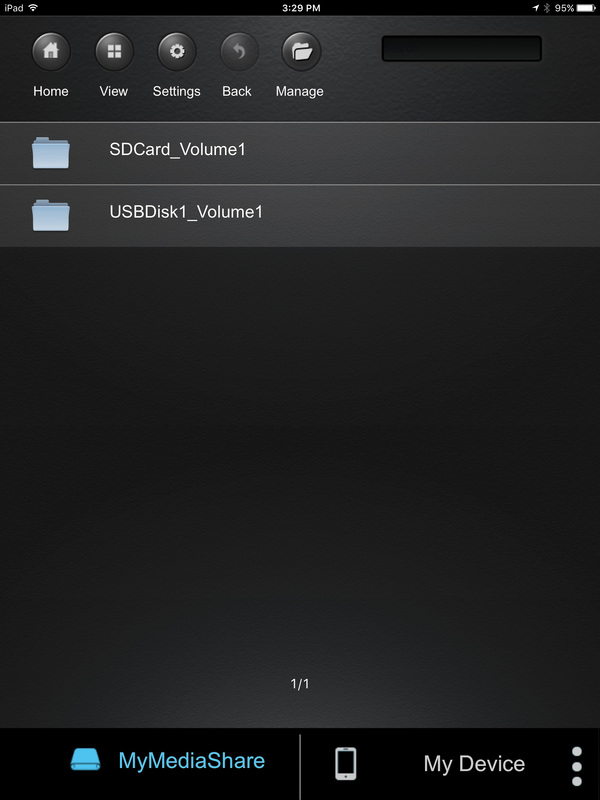 It will take a minute or so for the SD card and USB drive folders to appear. 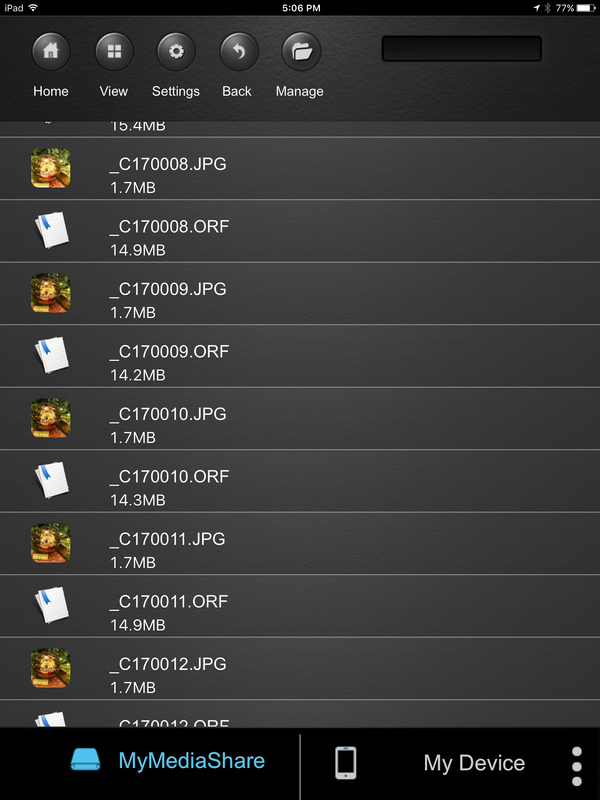 Navigate through your SD card folders to find the photo files. Hit the Manage button at the top, then Select All (or select files individually if you want). Push the Copy button at the bottom of the screen. A small dialogue box with possible destination locations appears. Select your USB drive. Do NOT create a new folder (see my gripe below). Push the too-small OK button. An informative Copy Status window opens that tells you what has, is and will be copied as well as a file countdown. In my tests, it takes about one hour to copy a full 16 GB card to a USB flash drive. List view of images on the SD card. You can change to an icon view with the View button at the top of the screen. The Copy Status panel is very thorough. I particularly like the file countdown (Total Files:__:1671). Here is my gripe: If I try to create a new folder on my USB drive using the above-mentioned dialogue box, the iPad keyboard slides up (as it should) and hides the dialog box. There is no way to see what is being typed and it is impossible to click the OK button. Worse, the keyboard freezes in place. The only way out of this situation is to force quit and restart the application. I sent an email to Verbatim Technical Support. Four business days later, Verbatim emailed their solution: delete and reinstall the app. This did not resolve the problem. The Copy dialogue box. You choose your destination folder here. The iPad keyboard totally obscures this panel should you dare to touch the Create Folder button. Navigate to the images on the SD card (or the copied images on the USB drive). Select a JPEG image. This brings up a nice full-screen preview to evaluate the composition and quality of the picture. If it looks good, hit the upload button at the top right corner. Select Add to Photo. The file is quickly uploaded to the iPad’s Camera Roll. Swipe sideways to review other images in the folder and upload to the iPad as required. The screen-filling preview makes it easy to evaluate images on your SD card. 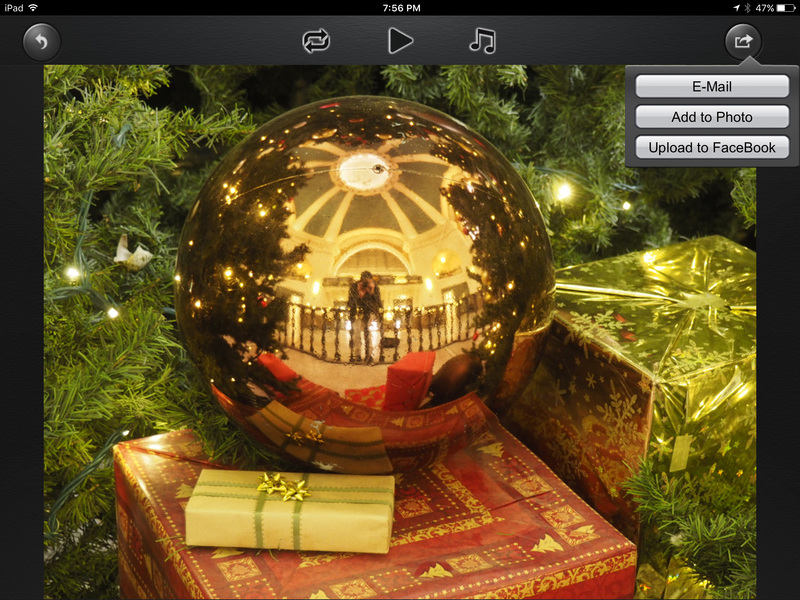 Hitting the Upload button and Add to Photo quickly transfers the photo to your iPad’s Camera Roll. Select My Device at the bottom of the home screen. Select the iPad Photos folder and navigate to the images you would like to copy. Hit the Manage button at the top of the screen. Touch Select All at the bottom of the screen or select individual files to be copied. Hit the Copy button, select your destination and then the tiny OK button. MediaShare only copies files, it does not move them. You need to go back to the iPad and delete them, once you are sure they have been successfully copied to the USB drive. If you really care about these images, they should also be backed up to a second USB drive before deleting the original iPad images. Based on my experience, I recommend the Verbatim MediaShare Wireless as a reliable, efficient and affordable way to backup photos while in the field. And it is remarkably lightweight and compact. The MediaShare Wireless unit and a set of four 64 GB USB flash drives can fit in a pocket and weighs a scant 170 grams. That’s 256 GB of solid state storage capable of surviving the bumps and knocks of a long-distance trek. The complete road warrior kit, ready to make backups, edit photos and upload to a blog or social media site. All on battery power, in the middle of the woods…if you are so inclined. If you need to transfer photos from camera to iPad for editing and uploading to a blog or social media, the MediaShare Wireless does that efficiently as well and makes full use of a high resolution iPad screen to display large preview images. There are also the bonus features. Like the battery that will fully recharge my dead iPhone. Or the reliable wifi bridge function. Being able to access wifi in a hotel while backing up my photos is helpful. Even more-so in a hotel with flaky wifi that barely reaches into its rooms. Assuming the wifi router is in the hotel hallway, placing the MediaShare Wireless near the door may help extend the wifi range to the comfort of a bed or desk. Its inability to create folders due to a glitch in the app. The slow response time of Verbatim’s technical support. These are annoyances, to be sure, but they don’t impact my own workflow. Folders are not essential to my backup needs and, with the exception of my folder issue, the device has functioned reliably. Hopefully, I will not need to avail myself of Verbatim’s spotty tech support again! Long winded techno talk seems your forte. Your comfort level with the material betrays the near emptiness of the walk/talk. The walk/talk reminds me of Ed Munch without the passion. I liked the “why not overlay a map of Paris to traverse Winnipeg’s streets and see the city from a different perspective” but really if it is a different perspective you seek, try not using a map at all – you will get farther faster. At any rate, thank- you David – some of the photography is very good. I have done a few walks without cameras and then redone the walk to photograph it, as you suggest. But, that’s like mapping out the photographs. I prefer to capture the immediacy of a new walk. That way there’s a freshness and spontaneity to the photographs. No preplanning. No preconceived story. At any rate, thanks for taking the time to vist my blog. There are many more photographs – and words! – to come. Hi, when you say that the select all feature deletes everything previously copied to the USB drive, would that make this inappropriate for taking on long trips and making daily backups on to an SSD? Not to worry. When you hit “Select All”, all the images on your card are written to your USB drive. If you have already copied some images from your SD card to the USB drive, the next time you insert the same SD card, presumably with more images on it, the Verbatim will write all the images on the card to the drive. This means it will copy the new images and overwrite (recopy) the images previously copied to the USB drive. You still end up with all the images on your SD card copied to the USB drive. If you insert a second SD card, it will not overwrite images from the first SD card because the image filenames will be different. I have used the device on a few long trips and it has worked flawlessly. I have never lost an image. As your SD card starts to fill with images, it will take longer and longer to transfer them to a USB drive. Often, I plug in the Verbatim and set it up to do the transfer just as I am going to bed.